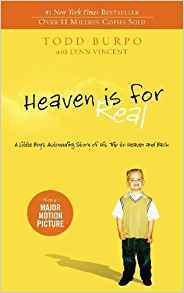 I’ve been an avid reader all my life, but one book that stands out on a very personal level is “Heaven is Real”, by Lynn Vincent and Todd Burpo. While the story and writing style might not be Pulitzer material, I read this right after my mother passed away and it really moved me. It gave me a strange sense of comfort that she is in a better place, and that she would be looking down on me and my children in the future (I had also just learned I was pregnant not long before that).